Once again, since the weather was gorgeous, I hosted the meeting at my home in the afternoon, giving the girls an opportunity to have some play time in addition to our meeting. 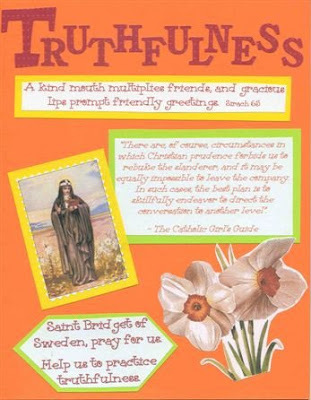 This month we learned about St. Bridget of Sweden and the virtue of Truthfulness. I was not able to find a coloring page for St. Bridget of Sweden, so I opted for a coloring page for the flower of the month, the Narcissus. Next I introduced the virtue we will be working on, Truthfulness, and read a short biography of the saint for this month, St. Bridget of Sweden. I was so excited to be able to use another excerpt from Chat With God's Little Ones (Lesson 30. The Eighth Commandment) to further explain the virtue of truthfulness to our sweet little girls. I just love that book! Following the lesson the girls began making their notebook pages. I included the memory verse and for Truthfulness, a quote from The Catholic Girl's Guide, and the prayer to St. Bridget of Sweden. The girls have done an excellent job making all of their notebook pages this year. It's so fun to look back at their beautiful pages from each month! With our end of the year Tea Party and Mother's Day this weekend, I also planned an additional craft for the girls to make and give to their mother's at the tea party. We made bouquets of lily's with outlines of the girls hands! I first saw it in a Family Fun magazine around Easter and LOVED it! I modified it a bit after seeing these directions online... Didn't they turn out cute? Snack time was next. Erica had been assigned snacks for this meeting, and even though she was not able to make it, she STILL dropped off snacks for the girls! She is so awesome AND she makes the BEST sugar cookies EVER! As usual, not everyone was able to make it, but we still had a wonderful time! I'll be back soon to share a few pictures from the tea party we had today. It was PERFECT!!!! Help us to practice truthfulness. Bridget is one of our girl names we are contemplating, and it is because of St Bridget that I love the name! Love all you posted, how much fun! Wish we could have been there, it looked wonderful! Jamie ~ I have an Aunt Bridget, and I have always loved the name. It's beautiful! Amy ~ I do too, though I totally understand. We are still praying for you and your family! See you soon. I am going to be starting a Little Flowers group this fall, and I have a question. How do you handle the patches when all of the girls have not been able to attend all of the meetings? Mary Beth ~ That is wonderful!! I hope it goes well for you! For our group, I didn't want to worry about keeping track of all the patches, so I gave them to each mother at the beginning of the year. For the girls that missed the meetings, I would send home the notebook page supplies etc, and the mother's could "make-up" the meeting at home so their daughters could still earn their patch. I am sure there are many ways to go about this, I have just found that this works well for my group.